Home Blog	The Best Cheap Make Up Chairs – We did the research for you! 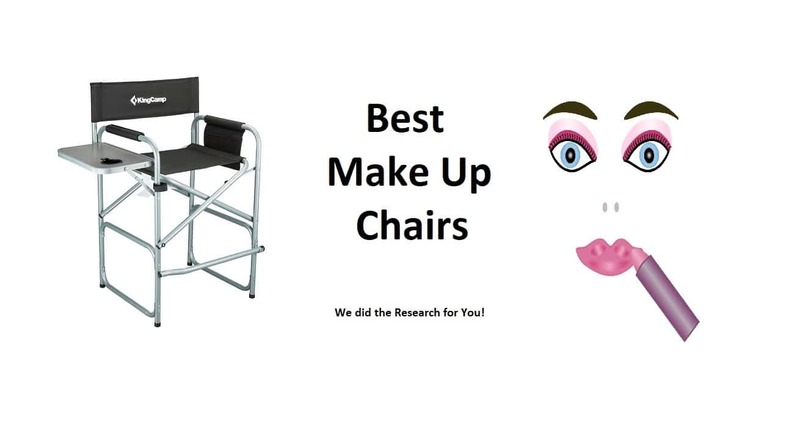 We selected the best make up chairs to help you make a decision. 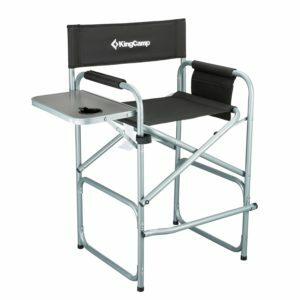 The KingCamp is a heavy duty, steel framed collapsible Director’s chair that comes with a side table for your convenience. This chair can support weight of up to 300lbs and the table folds out to ten inches in length. It has an in-built cup holder and enough room for snacks, magazines etc. Furthermore it has dimensions of 22 inches by 23 by 40. It folds up neatly into a compact and portable structure that is easily carried in one hand. This portable chair is the best value for money out of our list. It can be folded up and taken with you no matter where you go and is not heavy. This model includes a retractable footrest and uses 900D Oxford fabric for added strength, support and comfort. This chair has a strong back which cannot be adjusted. The height is ideal for make up artist to work from and the table can be used for storing cosmetics while you work/ There is also an attached storage bag for extra provision of space. Reasonably light and compact, easily portable. Durable design that can bear loads up to 300 lbs. Perfect height for Make Up design. Cheap, affordable price and good value for money. Not suitable for the heaviest of clients. Needs firm ground to stand on. May be too high for some shorter types. It is weighty if you were to carry it from job to job all day. Velcro strap does not provide optimum security when folded. The steel framing on the KingCamp means it is tough and stable on most flooring. It is easy to carry and can be unfolded in a few motions. The back stands at 16.5 inches and the seat is 22 inches wide. 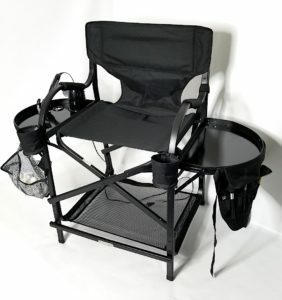 This versatile model can be used for more than just hair styling, it also makes a suitable camping chair with ample storage and that all-important cup holder that doesn’t just cater to high end clients. The KingCamp is only available in black, but this gives it the professional edge over other models. We found the price very attractive and other purchasers said they were surprised at how tall the chair was. The stability is greatly improved by the reinforced legs so there is no need to keep the construction close to the ground to add to stability. They also said it was easy to store, folded flat and that the footrest was perfectly placed. Of course there were some negative comments too, and we would be remiss in our review if we didn't include them. That nice headrest is immovable and cannot be adjusted, likewise this chair has only one height and cannot be manipulated per individual client. It isn’t as lightweight as the manufacturer would like us to believe and we found it to be a little heavy. This shows particularly if you had to carry it around for long periods of time. Some users found the chair to be a little high for the shorter members of the population while others loved the height. Overall we think sizing is all a matter of perception. In particular, if your intention is to use the KingCamp as a make up chair then height will be not as big of an issue. The chair has a Velcro strap to secure it in place that some customers found was “clumsy” but we quite liked that extra nod towards safety. If you do use the chair frequently and you are on the heavier side then you may notice that it will start to warp over time. This distention is to be expected but can harm the longevity of the chair. The chairs are good for outdoor functions or camping but will not sit levelly on an uneven surface. They also tend to sink in on swampy ground. Therefore you should always make sure it is on something more solid if you don’t want to fall over. That being said; it is highly unlikely you will be doing make up in the middle of a marsh! The KingCamp Tall Director’s Chair is a collapsible chair that makes a great portable product. Suitable for camping, hiking, make up, hair styling – you name it. It is a stable and sturdy chair given the height. Furthermore, it is also a very well priced for anyone starting out in the business. We loved this chair and customer reviews were very good. There is little to complain about with this model. Shorter people might not like it for a camping or outdoor chair but for a make up chair it is exactly what you need – and for a very affordable price, too. The Casual Home Counter Height Chair provides a classic style of seating similar to what you might find at an outdoor garden party – although it is higher, of course. The height allows it to be an excellent make up chair and it is available in 26 different colors. The counter height allows for it to present a more firm and stable seating platform for your clients. Additionally, it comes with in-built armrests and a footrest for your comfort. The dimensions are 39.5 inches high by 23 inches wide and 19 inches deep. It has a total weight of 10.5 lbs which makes it one of the lightest portable models that we know of. This chair is made from solid wood for durability and longevity. Although generally speaking aluminum or steel are always better if hardiness is a priority for you. Good color choice that looks good with most decoration. Very cheap, affordable and imported chair. Perfect for make up artists and photographers. Capable of withstanding the weight of most adults. Not particularly sturdy and a few reported quality issues. The foot rest and cushioning must be removed in order to fold the chair away. Longevity and durability are not high priorities of this model. This is a suave and stylish chair that will fit well into any salon or brighten up most lounge areas. As well as being good chairs for make up artists they are tall enough to serve as breakfast bar chairs. Moreover they work well for cast and crew and can comfortably sit clients weighing up to 350 lbs. We loved the classic shape of it but we particularly loved the low, cheap price. We can easily tell how this came to be one of the best selling make up chairs on the market. The chair itself isn’t too heavy and is easy enough to put up and take down. There is a little fussing around with the details but not much. It has been designed so that it is easy to transport and a good solution for school assembly seating, events and businesses alike. The seat can take the weight of most average clients without stretching. Additionally, it is made of canvas and wood which makes a more or less durable combination. The back rest is easily removable and can be custom-designed to have your initials embroidered onto it should you so desire. The washable covering is the peak feature on this chair. Verified purchasers liked the brass-esque touches on the finishings, the spacious seating area and the height. It might not be suitable as home ware for the shortest or heaviest of clients, but for everyone else it seems to do suitably well. Additional compliments were paid to the feet, which do not mark even the most highly polished of floors. This chair is not the most sturdy of make up chairs. It has those machine washable parts but without the fabric attached the chair is unusable. It gets difficult for those of a heavier frame and, as we mentioned, for those who are very short. Some people have expressed concerns that their package did not arrive in an orderly fashion i.e. that some of the screws were missing. Also, it was reported, that the customer service they experienced was a little less than entirely helpful. Another user commented that they looked nice but couldn’t be physically used. We found the canvas to be reasonably tough and the chair to be well constructed; even if the materials used let it down somewhat. The sturdiness is a bit of an issue with the Casual Home Counterweight, particularly for those that want to use it in a professional capacity. The construction is questionable despite the volume of customers that buy it time and time again. This chair is a good example of price matching quality, and you will get what you pay for. Customers reported that the legs had a tendency to split. Parts and screws were missing and some purchasers reported receiving the wrong color of canvas. One reviewer mentioned that the chair had broken under her while she was using it at work – not a good investment for the long term. Damaged wood and missing parts are frequent issues with this chair, so when you buy you will have to take your chances. This is a cheap and cheerful chair that does exactly what it promises to do. Although it makes an excellent make up chair it isn’t the best general furniture for stowing around the house. It does fold up neatly and is easy to carry around with you. Users have noticed some trouble with parts and supplies not arriving and have struggled with the general durability of the chair – but in a pinch and at such a good price it is still a useful model. This is the best-selling of the make up chairs on our list even if it isn’t quite the best in quality. If issues with the woodwork are likely to bother you we would recommend opting for a slightly more expensive model. Similarly, this chair is not suitable for those who are of the heavier persuasion, but might actually make good seating for the elderly or anyone else who struggles to raise themselves out of a chair. The Casual Home Counterweight Chair makes a good starter Make Up artist’s chair, director’s chair or photography accouterments. It provides portable, comfortable seating wherever you need it but we wouldn’t recommend outdoor use if you can help it. 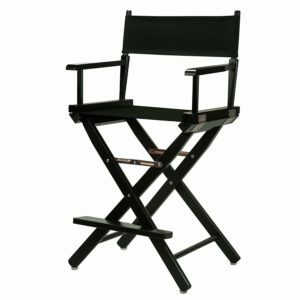 The Tuscany Pro Make Up Chair has a seat height of 25 inches, meaning it has been designed to sit higher to allow you freer movement around the customer. This chair comes with a polyester fabric blend set on a durable aluminum frame. Additionally, it has an in-built anti-tipping device to add to the stability. It also includes a bonus storage make up cart when you buy it from the seller above. The Tuscany Pro comes with a convenient carry strap and folds up neatly for ease of portability. The whole product weighs a total of 16 lbs and comes with a fantastic ten year warranty, making it one of the best professional make up chairs available on the market. The supplier will embed your name or logo onto your chair if you contact them beforehand. The manufacturer also ships internationally but bear in mind that extras come with extra costs. Steady, sturdy, professional model with hard aluminum legs. Footrest for ease and comfort. A giant chair suitable for adults, easily one of best professional models on the market. Trays with rims are included as part of the deal. Ten year warranty so if it does suffer a defect you can have it replaced. Great Weight bearing capacity of up to 400 lbs. Perfect for hard wear and regular use. It comes at a high price for the high quality you receive. A little on the bulky side for transportation, although it is light. Too high to be used for children, a smaller model might better suit. It is not a waterproof chair and is not suitable for outdoor use. We love the option to have your logo emblazoned on this chair. We also love the high quality, professionally based design of the Tuscan pro. This chair offers a proper, effective take on the professional, studio standard make up chair and looks suave and efficient to boot. Additionally, clients up to 400 lbs had no trouble fitting into it comfortably. It is high enough, however, that shorter clients might require a stool. The base of this chair is heavy enough that the stability is assured, no matter how much your customers squirm. Other users reported it was highly durable and had lasted through years of constant use. Those who wanted to upgrade from this chair did so by buying a replacement of the same model. It is not the kind of make-up chair you would have in your home but it would make a perfect addition to any studio. We found the Tuscany Pro to be extremely comfortable and easy to move around. Obviously the ten year warranty is a big plus with this buy. It is our opinion that not enough make up chairs come with a guarantee. Many of them are not built to last like this one is. We also liked that you receive that extra freebie in the make up cart, which makes for ample storage of all your sundries. Moreover, the aluminum construction makes for the best of both worlds in terms of longevity and stability. Lastly, this chair also folds away to become portable – which is like the cherry on top of a very well iced cake. The heaviness that has been imbued on this chair can work against you with the younger clients. They will need a stepping stool to reach the chairs heights should you be in regular receipt of child customers. The carry bag is excellent quality and the model does fold flat, but it is a little bulky when placed over the shoulder. Some consumers did report that they felt it a little heavy for all day use, but at 16 lbs we say there is very little to complain about. The price is a big con for many verified purchasers. Like we keep saying: you get what you pay for. This is a high grade, premium quality chair that doesn’t come cheap. We think it is worth the price and so do their hundreds of customers. Users noted that children climbing up and down into their chair was the cause of many a make up spillage and noted that as something other face painters should be aware of. We also noticed that the legs do not fold away properly like the rest of the Tuscany Pro, so this is what makes it bulky in transit. One consumer ever advised making sure you had a wide car before buying. Verified purchasers felt very strongly that this was a good purchase and a high quality item that they did not need to return or contact customer service about. Many reported quicker transport times than expected. When it comes to con’s for the Tuscany Pro, we came up that little bit short. The Tuscany Pro Make Up Chair is great value for money even though it sits on the higher end of the price range. It is durable, hard wearing and dependable, as well as being solid and steady. The aluminum legs provide ample support and this is the perfect chair for housing plus sized clients with ease and without embarrassment. The price of the chair can greatly affect what quality of make up chair you managed to procure. The cheaper models come in slightly above the fifty dollar mark. However the more tailored models with better design, higher durability and more special features can easily run into the hundreds. Some cheaper models are fine to start out with, but they won’t last. Unfortunately it is a case of getting what you pay for. Quality is directly related to price in the case of most specialist chairs. Our research found that the cheaper the model the more likely it was to break. It is almost always the legs of the chair that break first so when trying to buy a long lasting model make sure the legs are either steel or aluminum. Wooden legs tend to split or buckle over time. Choose a model with reinforced legs if you can. When buying a specialist chair balance is a huge deal. If the chair is high, as is the case with make up chairs, then it needs to be heavy on the bottom to balance the weight. Certain chairs will tip if you do not use the footrest. Others choose to keep the height closer to the ground for stability, as is the case with camping or hunting chairs and portable toilet seats. Balance is also a consideration in buying a giant bean bag chair. You do not want one that you lie in and touch the floor. Choose a bag with lots of fill and contact the manufacturer if your bean bag lounger is defective. Most common chairs will rely on a low height for better balance. In the case of a make up or hair stylist’s chair you will need extra height. This way you can either prop the chair against the sink and wash hair or manage to create flawless looks without breaking your back. Again, some chairs only balance well with the footrest engaged, so a counterweight chair might be better for those that want something tall. The wooden framed chairs always break more quickly than the steel or aluminum. Likewise, polyester blends won’t last quite as long as canvas. Reinforced legs or even bar supports will add longevity and durability to the structure. Some models also come with structural additions such as foot rests, arm rests or side tables and cup holders. Many times, structures need to be taken apart for transportation. While some portable chairs have removable fabric for washing others do not. Make up chairs may or may not have a machine washable cover and may need refilling over time. . Likewise, make up chairs of poor quality will need replaced over time. When you own a salon it is important that you can brand your chairs. Look for a manufacturer that allows you to emblazon your logo onto the chairs that you buy. You can also customize things like color on most types. Some make up chairs are also available in varying levels of height and with or without counterweight technology. In the case of the hair stylists or make up chairs the base will be wood, steel or aluminum. The material for the seating is often canvas or polyester and is sometimes sprayed with anti-inflammatory protection. As far as portable hair stylist or make up chairs you will find a variety of colors and choices. You can also have your logo emblazoned on the back in some cases if you are willing to pay a little extra. Obviously comfort is important when dealing with clients and must be taken into consideration. For portable chairs this means they can sit in it for extended periods without aching. 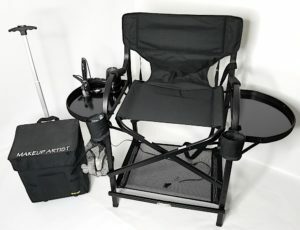 Portable versions of make up chairs and hair stylists chairs should be comfortable enough for sustained use by a client. They should be strong and supportive while still being able to fold down into neat, carry-size bundles that preferably feature a carry bag or strap. Be careful that the bundle is compact and secure while being transported and make sure you buy a lightweight model since your kit is already heavy enough. Always double check the height before ordering. Headrests, footrests and canvas sections can often be added or removed. Some models even come with additional parts sold separately, such as cup holders, tables and side pockets. A giant beanbag chair should be easily moldable into any shape that you like! A few chairs come with guarantees or warranties but you will find that these tend to be higher end models. Portable models are only likely to have a warranty if they are purchased from big brands and that is something worth considering if you mean to buy professional goods. Most make up chairs come with optional extras. A side table, cup holder and pockets are not uncommon. Some come with head or foot rests, others you must buy these as separate attachments. The biggest brands (such as the Tuscany Pro) will come with extras thrown in at no cost like a make up storage cart. OK, So we already did the reviewing part, but scrolling through previous customers comments on Amazon or Ebay is the best way to get a real feel for the product you order. Other customers are much more likely to give perfectly honest feedback than you will find in a review. A lot of the time we review writers have to tone down the more colorful comments for reasons of language used. When you scroll through the yourself you get a better idea of what to expect. While reviewing which specialist chair to buy we found that some make up chairs came with legs that were ‘100% wood’. Judging from our own experience coupled with customer comments, we managed to deduce that this isn’t a good thing. The unspecified wood is often shoddy. If you want to buy wooden framed make up chairs then ensure the wood is named. Wood tends to fold away better and is a much lighter choice for a portable chair than steel models are. What you gain in portability you loose a little in longevity, but the choice is yours. Aluminum presents a sturdier option that has the potential to bend if too much weight is placed on it. For this reason most aluminum legs have been reinforced or have cross bars for extra support. Try to ensure that you do not exceed the weight load. Likewise, canvas on either types of chair is likely to stretch over time. So the tougher the fabric choice the better. Aluminum is light to carry, compact when it folds and sturdy enough to last a long time. It won’t rust but we still wouldn’t recommend leaving it outdoors. If you are going to have to work outdoors a lot then we would recommend an aluminum model. The aluminum is an all-round more portable substance but you are likely to pay a little extra for it’s use in a chair. Amazon (as always) has the biggest range. If you are looking to buy it is a great place to start. They have an online, International marketplace – but of course we would recommend keeping your carbon footprint low by buying as locally as possible. There are plenty of exclusively USA or Canadian made companies out there to choose from. Through Amazon you will have access to most brands, most color choices and chairs sent from most locations. You also have the most volume of customer feedback to review before you buy. This means a helpful service that ads in your final decision with accurate data. Amazon would be our first choice of online retailer for specialist chairs. Ebay is the second biggest retailer of hair stylist chairs, make up chairs, barber chairs with hydraulics, portable specialist chairs and giant bean bags. Their choice is a little more limited than what you might find on Amazon since their marketplace has a little less reach. You will be just as likely to find American made products though, just watch out for the variable delivery charges. If you can, try to find a chair with free postage when using this site. You may also find these chairs from specialist retailers but we can almost guarantee they will be more expensive. Likewise, you may come across the odd variation on our list in Costco or other large retail stores. Before you purchase your chair check the price on Amazon first. We found the largest variety of specialist chairs on Amazon, though they can be found on Ebay as well. Things to think about are longevity and the materials required for long lasting functionality. Whether or not the cover or canvas parts are washable, how much strength it takes to move your chair or beanbag, how portable it is, how adjustable it is, what color, size and shape you want and, first and foremost, whether or not you can afford it. High quality comes at a price but often it is worth the extra money to gain a high quality item that lasts. The best of portable chairs are easy to fold, compact and yet sturdy. Above all else; always scroll through the customer comments section before you commit to buying, and all will be well. Thank you for taking the time to read through our Ultimate Guide to Make Up Chairs today. We hope we have helped to unite you with your perfect seating partner. If you need help choosing seating in the future please do return to us for guidance. Likewise, feel free to share our guide in the hopes that we can help others find their chair made in heaven. Good luck out there, your perfect partner might be only a single click away!